January 23, 2018 at 11:12 am EDT | by Lou Chibbaro Jr.
Doug Schantz, owner of the popular nightspot that caters to the LGBT community, decided to open its doors earlier than its normal 5 p.m. opening to lift the spirits of federal workers who make up a large percentage of its customers, according to Nellie’s general manager Justin Thomas. 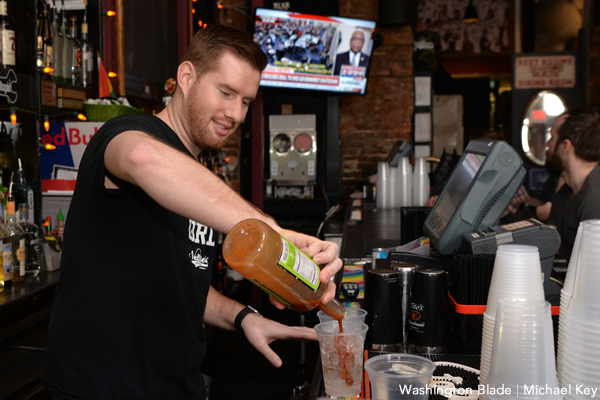 “We are very much a neighborhood bar,” Thomas told the Washington Blade as reporters and commentators with CNN and MSNBC appeared on two giant TV screens hanging on the walls of the bar’s front room. Among those watching the TV news broadcasts was D.C. resident Noah Johnson, an economist with the U.S. Department of Labor’s Bureau of Labor Statistics. Johnson said he and two of his colleagues came to Nellie’s after being required to come to their offices Monday morning to secure their work stations before being sent home on furlough. “You had to report and make sure everything was secure,” he said. “We are a statistics agency. We can’t leave personal information out. So we had to lock up our computers and make sure if we were out for a period of time they wouldn’t be at risk,” he told the Blade. Johnson and his two co-workers joined other federal workers at Nellie’s, including two civilian Department of Defense employees who declined to disclose their names, in watching with great interest as CNN and MSNBC reported that Democrats and Republicans in the U.S. Senate had just reached a compromise agreement. Minutes later, the news stations reported that the Senate voted by a wide margin to end a filibuster, clearing the way for approval of a temporary spending measure to reopen the government. The U.S. House approved the compromise spending bill and President Donald Trump was expected to sign it. Johnson said he was looking forward to going back to work Tuesday morning. But on the very first workday of the shutdown on Monday Johnson and his two co-workers experienced first-hand what thousands of D.C.-area residents were expected to encounter in the fallout of the government shutdown. Prior to coming to Nellie’s they decided to go on a hike along the grounds of the National Arboretum in Northeast D.C., a federally owned and operated track of land in which a wide variety flowering plants, shrubs, trees, and grass are grown and cultivated. “We wanted to go to the Arboretum but the Arboretum was closed,” Johnson said. Thomas, the Nellie’s manager, noted that the bar is widely known as a place where people can come to watch local, national and international sporting events, including the Olympics, the Super Bowl, and World Series. But he said Nellie’s also tunes its TV monitors to important breaking events in the news.